From the coast of California to the coast of Italy, our home designs represent some of the unique architecture found in Santa Barbara, as well as Tuscany. We've brought exquisite details from homes in these two beautiful locations to the homes we build against the backdrop of the majestic Rocky Mountains. Step inside and gaze upward at the 10-foot and vaulted ceilings that are standard on every model. Experience the abundance of windows that give our homes an airy and open feel. And find the interesting niches that add flair to each model's personality. Stucco exteriors, tile roofs and a variety of different floor plans and intriguing options will reflect your individual taste. Our single-level homes start at 4,000 square feet. Walkout lower levels are also available on selected lots. Priced from $700,000. 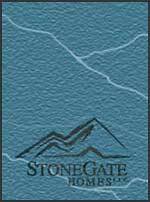 Stonegate Homes is a builder that is committed to building a better home. Part of that commitment is to have each of our home's energy performance certified by a third-party inspection company —an Energy Star Qualified Home. Stonegate Home participates in the Built Green Colorado program. The purpose of the program is to inform and educate the home-buying public on the value of a home that meets the Built Green criteria. The informed homebuyer will recognize the value of the greater energy efficiency, healthier indoor air, reduced water usage, improved comfort and durability, and reduced maintenance of a home built to Built Green standards. To achieve the Built Green distinction, homes must be designed and constructed based on a rigorous checklist of more than 200 features in 22 categories covering energy efficiency, materials, health and safety, and resource conservation. But, perhaps most importantly, the homebuyer will know that a Built Green home is a better home. Stonegate Homes has received numerous awards of Recognition of Commitment to Quality and Excellence. Stonegate Homes' work has been featured in several magazines including Better Homes and Gardens and Architectural Digest.